A lot of people, particularly my patients, ask how I can work all day, and still have time to put dinner on the table each and every night. I have an amazing wife, and she does everything around the house…but she does not like to cook. Works out great for me since cooking is very much my way of winding down in the evening. I like to get my kids involved, and we have already begun to enjoy time chopping veggies as a family. I love to spend hours prepping and making more complex dishes, but that is more of a once a week deal these days. Most nights I get home after a long day and need to get food on the table for the family in less than an hour. So, here is how I go about my most basic meals. Any meal at my house starts with what kind of meat we are going to eat! I try to keep things interesting, and my kids are used to eating all types of beef, veal, lamb, chicken, turkey, and various seafoods. When I need an animal based protein quick I turn to two methods: Either a quick cook on the grill, or a quick finish on a pre-soaked Sous Vide meat. Grilling is obviously easy and accessible to almost everyone these days and you don’t have to spend tons of money to have a more than functional grill. I may be in the minority here, but I just don’t understand the concept of overdone MARINATION of meat. When I eat beef, I want to taste BEEF! Although at times I will marinate meats with specific goals in mind, I generally never do so. I also always cook my meat as little as is safe to maximize the flavors. Here are my preferred meats when it comes to grilling. The Sous Vide style of cooking is relatively new to my household as I purchased my Sous Vide Supreme Demi around 6 months ago. For those who do not know what sous vide cooking is, it is best described as cooking vacuum sealed food in a precisely controlled water bath for a set period of time. I will be posting on more specifics of sous vide cooking soon, but until then just google the topic or search YouTube and you can learn quickly about it. Now, if you are like my wife, this will all sound extremely complicated and like a way to spend more money on unnecessary kitchen equipment! That said, she has told me repeatedly over the last 6 months that the Sous Vide has been one of the best investments we have made for the kitchen…ever! Why is it so great? You can take any cut of meat, vacuum seal it, and as long as you leave it in there for the minimum time to cook it, you are good to go. The best part is that although there is a minimum time to cook it, there is generally no maximum time (unless you are cooking more delicate protein like seafood in particular). What this means is that like today for example, before I left to round at the hospital I filled up the sous vide, set the temp for 137 F, and popped in the 3 pound pork loin roast I vacuum sealed last night. It will cook in 4-5 hours, but I’ll just pop it out at dinner time, dry it thoroughly, and finish it off in a very hot cast iron skillet for 90 seconds or so a side. What this means practically is that with a little planning, I can have my meat finished and on the cutting board in literally 5 minutes after coming home. 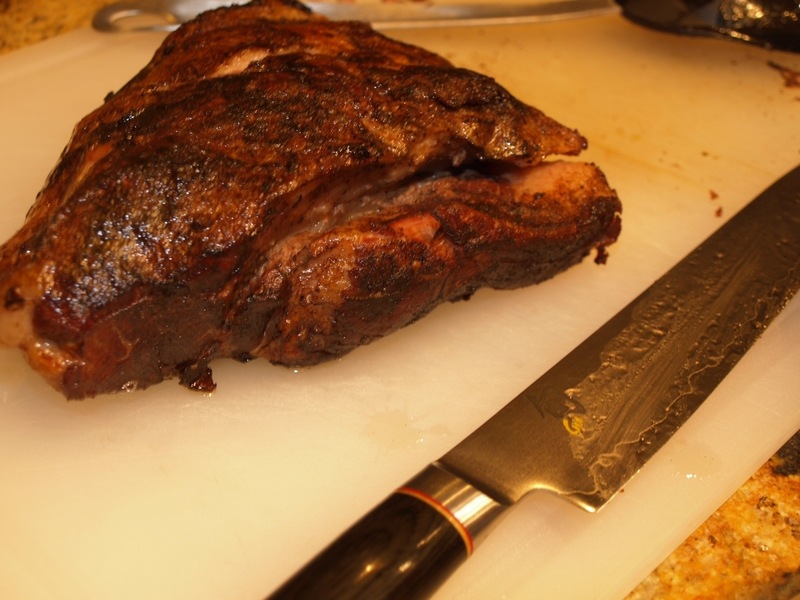 All the above cuts of meat will work in the sous vide, but feel free to add tougher cuts of meat like a regular old beef chuck roast or brisket for example. Let the less expensive roast or brisket cook at 130 F for 48 hours and finish off in the skillet. 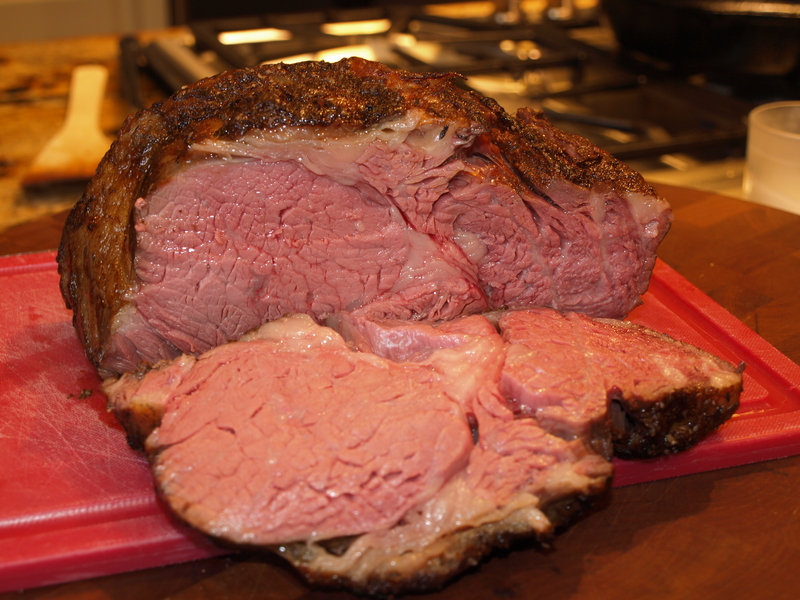 Chuck roast turns to prime rib by just taking a bath on your counter for 2 days! Anyway, I could go on forever about my sous vide. For some awesome recipes visit my friend over at Nom Nom Paleo, and if you have an iPad check out her App which even has it’s very own sous vide section! So, now the protein is out of the way, what’s next? My next step is usually to attack a vegetable. 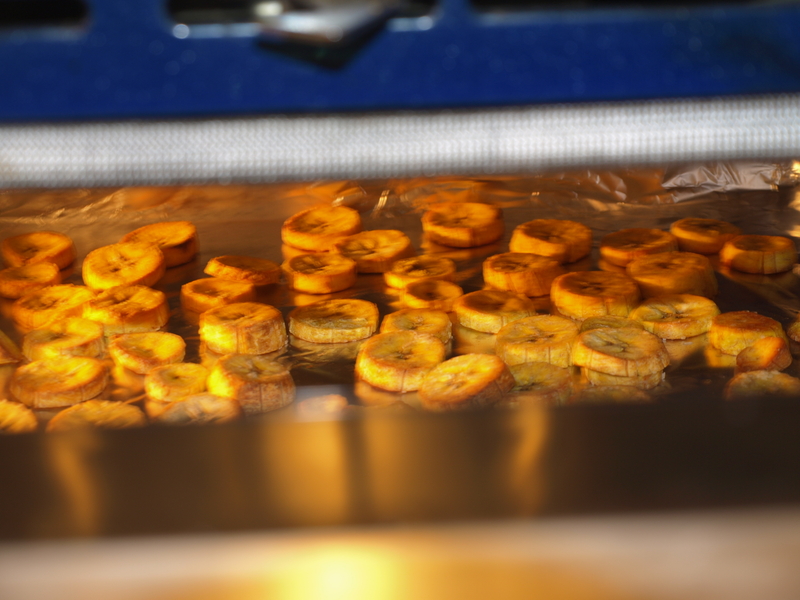 When I’m crunched for time, there is only one way in my book to make vegetables taste great…roasting them at high heat! 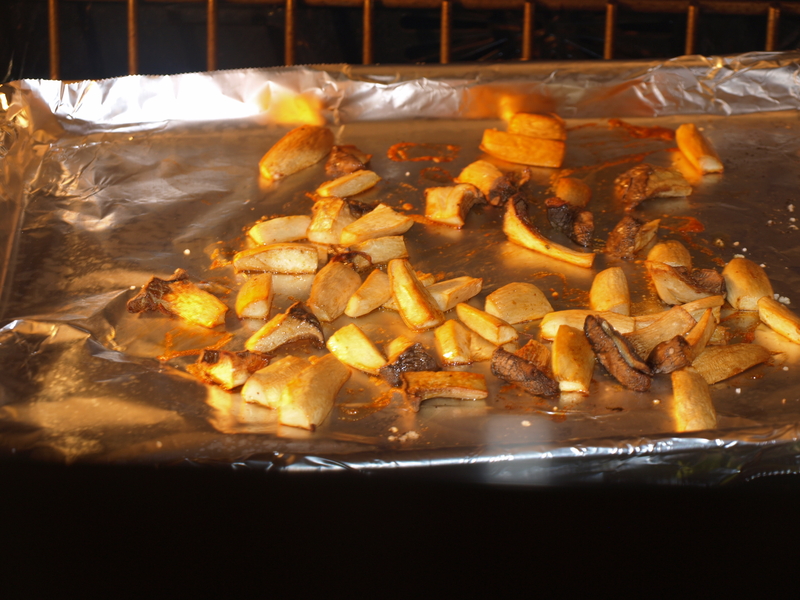 The process is pretty simple, I take whatever vegetable I want to roast (or a combination of them), chop them up into similar sized pieces, line a baking sheet with heavy duty aluminum foil, and toss them with olive oil, salt, and pepper. I set the sheet in a pre-heated oven set on convection 425 F. All you do next is set the time for 10 minutes, check the veggies and toss around a bit on the sheet. Set the timer for 10 more minutes, and repeat. 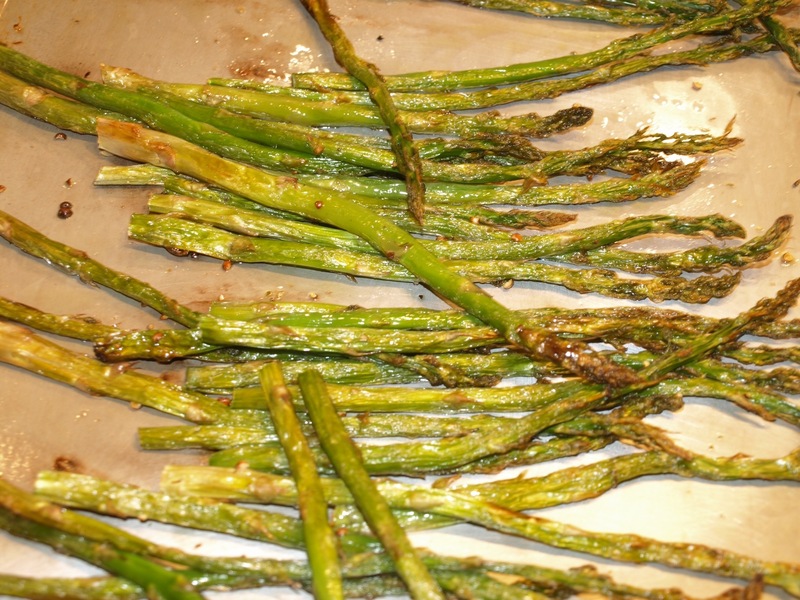 Just keep doing this until the veggies are charred, crisp, and delicious. Here is a list of veggies I have cooked in this way, at least what I can remember. If you can think of others, I’ve probably roasted it! 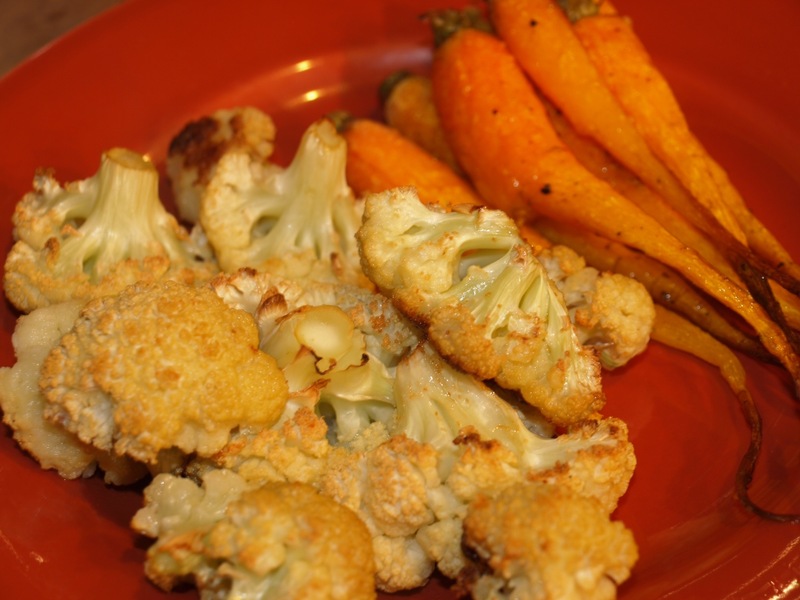 The other important thing is, especially if you are trying to get picky eaters like kids to eat veggies, is there is a BIG difference in flavor from for example cauliflower boiled in water and drained vs roasted to crisp perfection in the oven. In fact, if there is a veggie on this list that you think you don’t like, do yourself a favor and try roasting it. I’ll almost guarantee you will like it cooked this way. Oh, and one last thing. Steaming and boiling will no doubt leach some vitamins and minerals out of the vegetables, so high heat cooking should help seal those nutrients in so they can benefit you and your family. Well, at that point I’m feeling pretty good about dinner with a solid protein and tasty vegetable on the side. The last thing I will often do is cut up some fresh fruit or berries and serve it on the side in a little bowl as a “dessert” of sorts. To my family there is nothing better than ending a meal with the fresh flavor of naturally occurring sweetness you can only find in for example a perfect strawberry. This may all sound complicated, but once you put it into practice, you will be amazed at the ease with which you can get great tasting Paleo meals on the table with a tremendous amount of variety. Add a salad on the side if the fruit is getting old, you can really do anything you want! All this being said, nothing is more important to cooking for the family in a timely fashion than good old fashioned planning. Think ahead 1-2 days and make sure you have your meat bought and thawed, or sealed and placed in the Sous Vide if required. Shop for veggies 1-2 days in advance only to ensure freshness, and also to make sure that whatever you are cooking sounds good to eat on that particular day. How many times have you bought something on sunday to cook thursday, and by the time thursday rolls around it just doesn’t sound very good? Avoid that by shopping more often. It’s a bit of a pain, but it’s just the way I do it. I hope this helps a little on giving you the confidence to try consistently to create fresh and delicious Paleo meals for your family in a time frame that works for you. Once you get organized, putting together a meal in this fashion should take anywhere between 30-45 minutes start to finish. Admit it, even YOU can do that! I’ll try to post pictures of the Sous Vide Pork Roast tonight or tomorrow if able. Greetings everyone, it’s been a week or so since I’ve posted…just took a little time off to recharge the batteries. I’ve also been working like crazy, but then again, what’s new?! Over the last few days I’ve started cooking again a lot more, and it has really got me thinking about finally going to work on reworking my favorite recipes to make them Paleo. My main passion in life has always been cooking and it’s the one thing I do everyday to relax and unwind. Many see cooking as a chore, I just don’t in any way. So, here is the first of my efforts. Sorry in advance for the lack of photos, my camera was out of batteries! Cut the Chicken breasts into bite sized pieces, season with salt and pepper, and set aside. 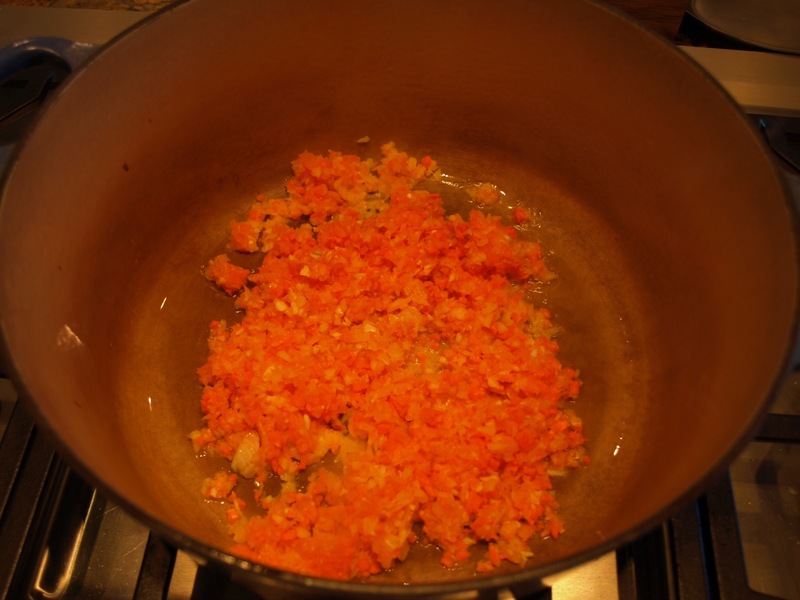 Chop the onion, carrots, and celery into very fine dice. Warm up the chicken stock just a bit and put the saffron in it to start the flavors infusing into the stock. 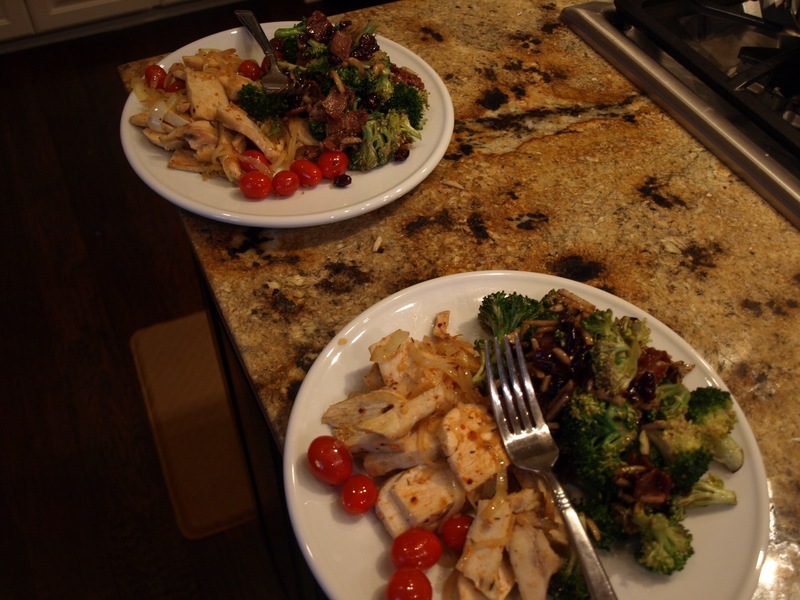 In a heavy bottom pan sauté the chicken in two patches with a healthy dose of olive oil. Once the chicken is cooked and starting to brown remove to a warm plate. Add a touch more oil and cook the onion, celery, carrot, and garlic clove (roughly chopped) until cooked down, maybe 5-7 minutes. 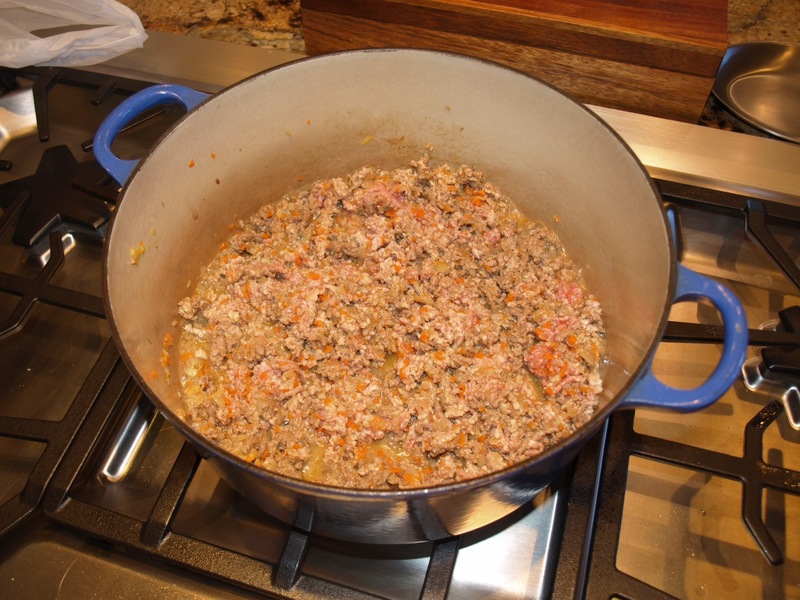 Once the veggies are cooked add the saffron stock and almond meal stirring to combine. Add the chicken along with another cup or so of water, bring to a boil, and simmer for 30 minutes. 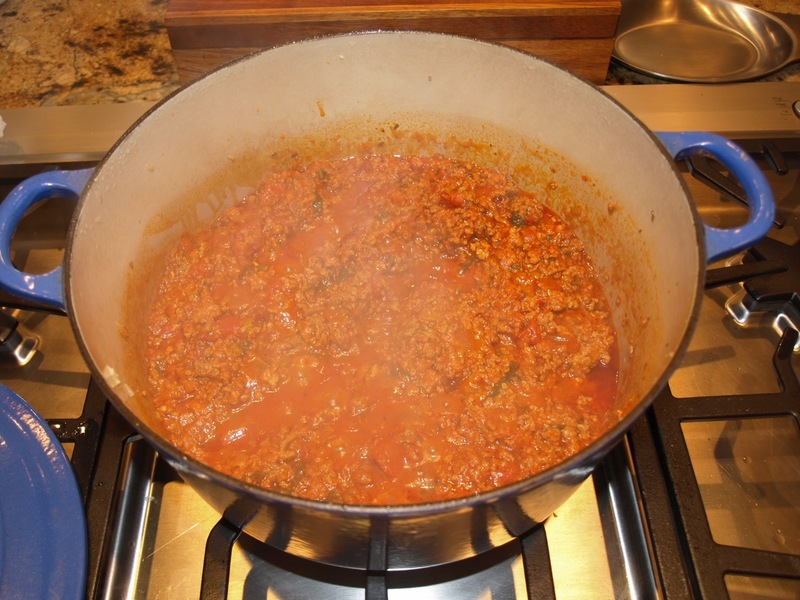 I like to let the sauce reduce a bit towards the end of the cooking to concentrate the flavors a bit. Serve over some Cauliflower rice and top with as much fresh cilantro as you like! 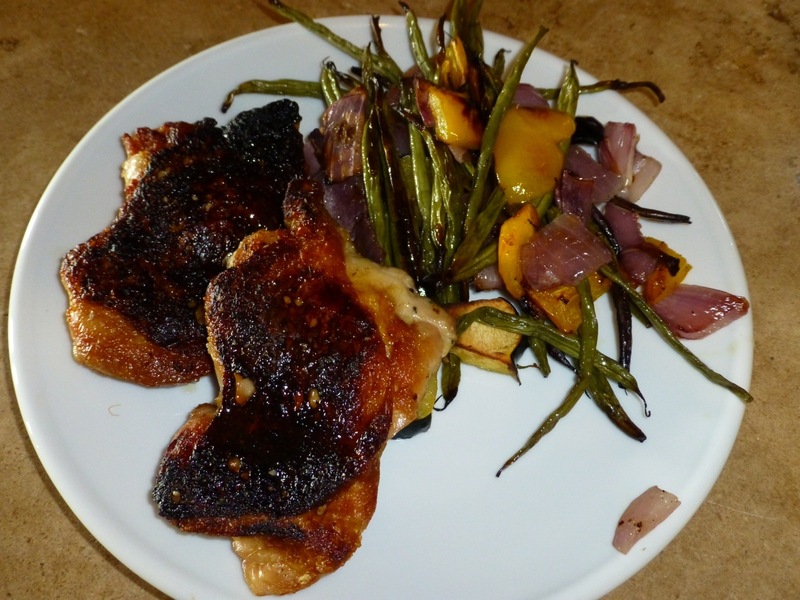 I served it here with some simple roasted okra and it was an awesome meal. The combination of the saffron and the almonds is amazingly rich, and I think I could eat this every night! Hope y’all get to try it and share my love for this dish! 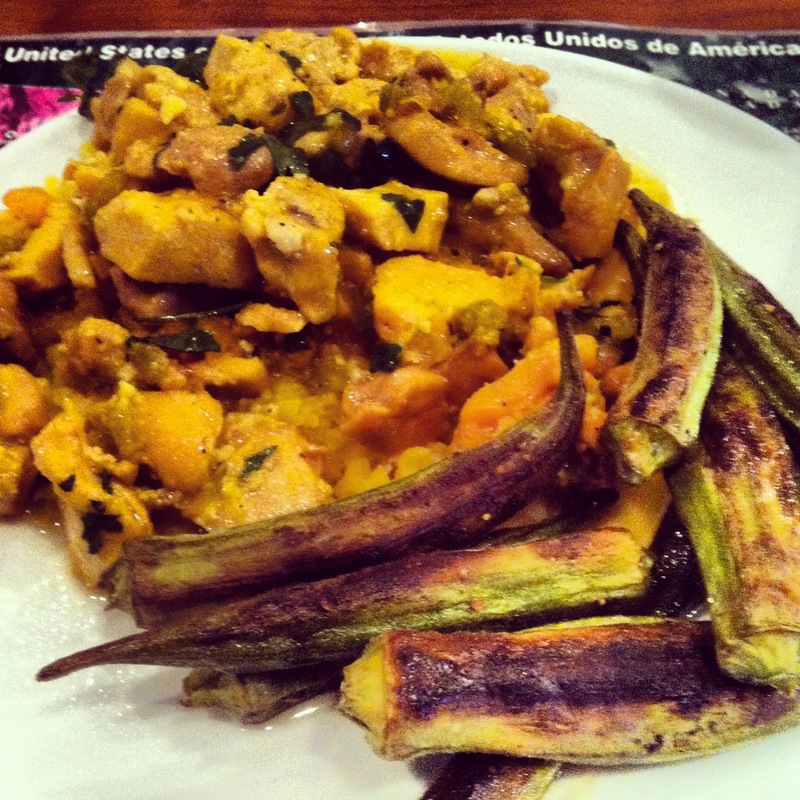 I’m a big fan of Moroccan flavors, and they lend themselves fairly well to Paleo conversion. Hope all have a great Fourth of July!! Hey everyone, been busy lately and haven’t actually done much cooking. But, I have managed to create a few goodies. First, I decided to experiment with Eggplant Parmesan. 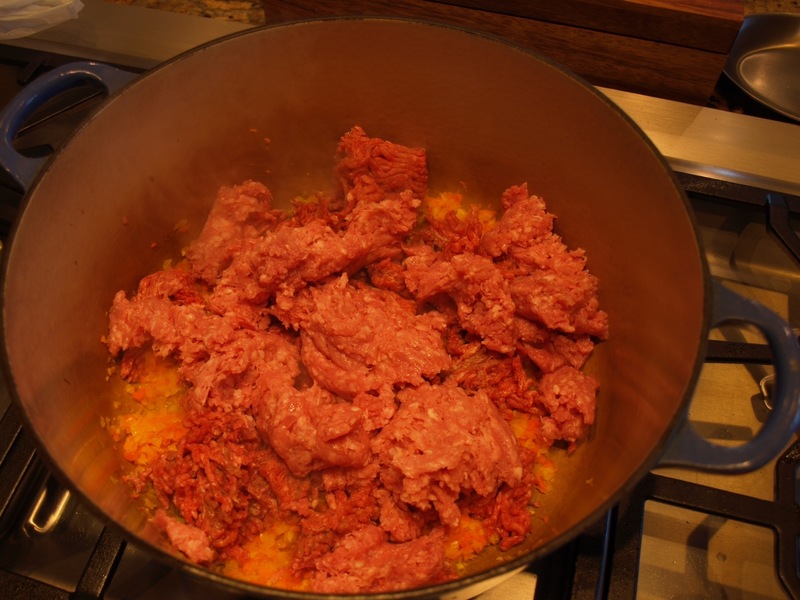 I wanted to keep it rather light, so I started with the meat sauce. I took one carrot, on onion, and two garlic cloves and I chopped them up in the food processor. I personally like the veggies chunkier…but this is the easiest way to covertly put them in the sauce so the kids won’t notice! Throw the Veggies into a heavy pot with a little olive oil and cook until soft. 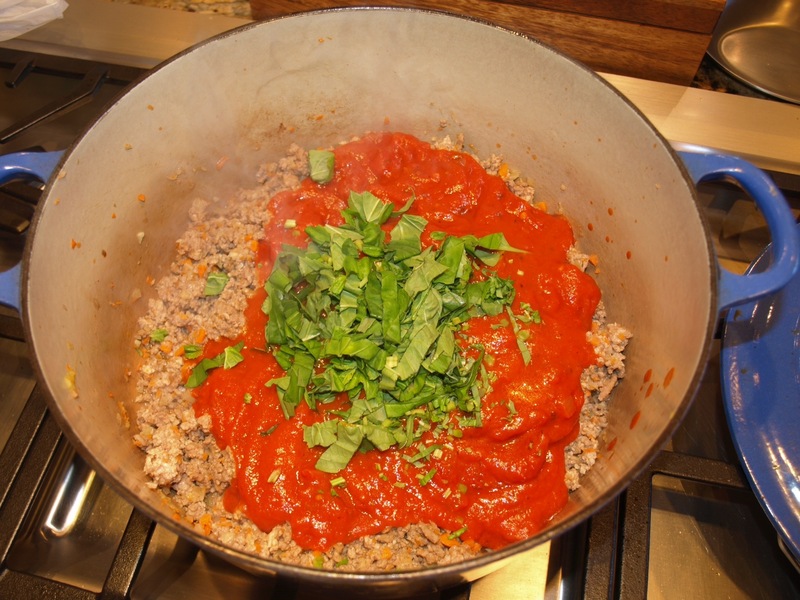 Drain off the excess fat and add your favorite Paleo friendly tomato sauce. 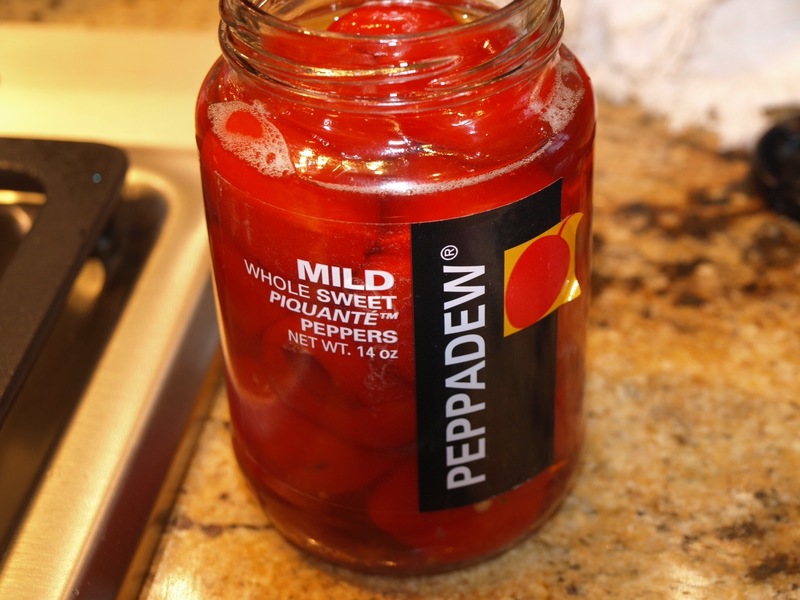 I make my own, but you can get them at the store pretty easily…just read the label! I also toss in a good handful of fresh basil leaves. Mix it up, and simmer on low covered for as long as you want. 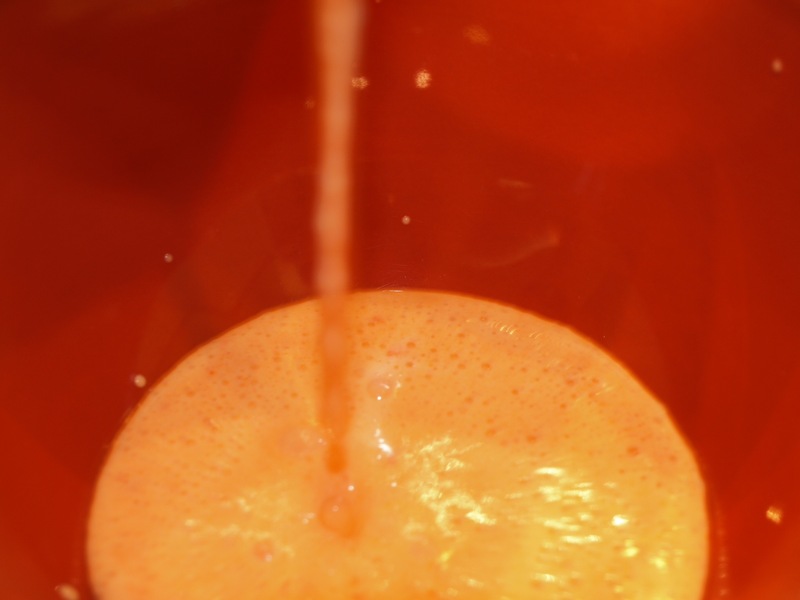 I like to let mine simmer for at least 4 hours to get it very smooth. You can go for as little as 20 minutes though in a pinch! 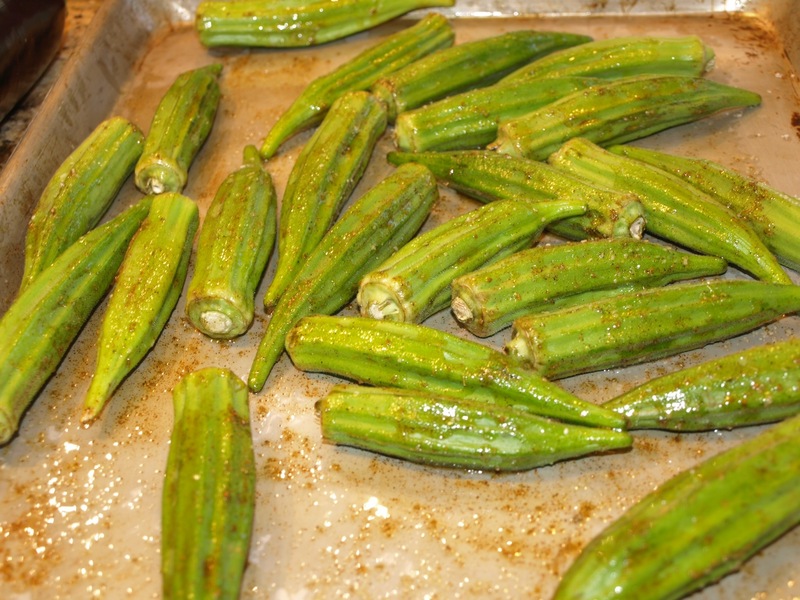 Next I cleaned some whole Okra and followed the recipe in Paleo Comfort Foods for Oven Roasted Okra. It is so easy, and was really good. 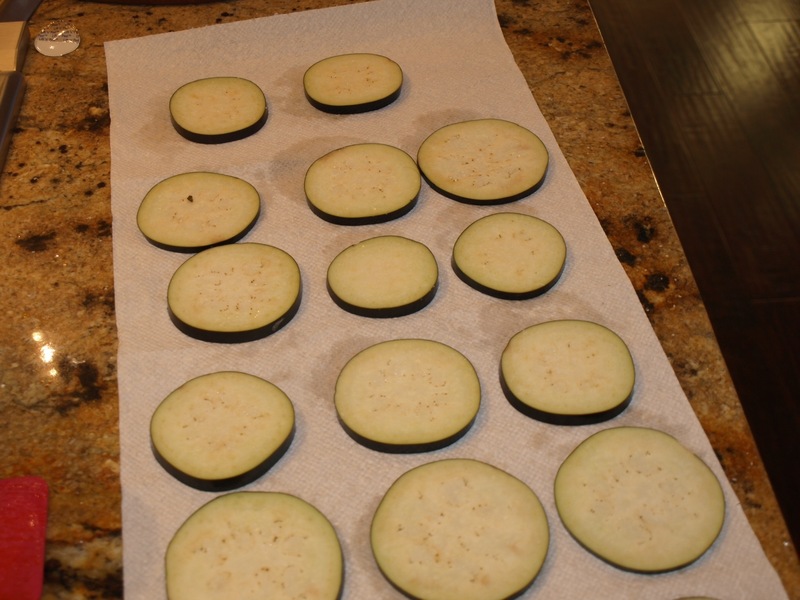 I heated up a good bit of olive oil in a skillet and fried up the eggplant slices until golden on both sides. No breading, just high heat! 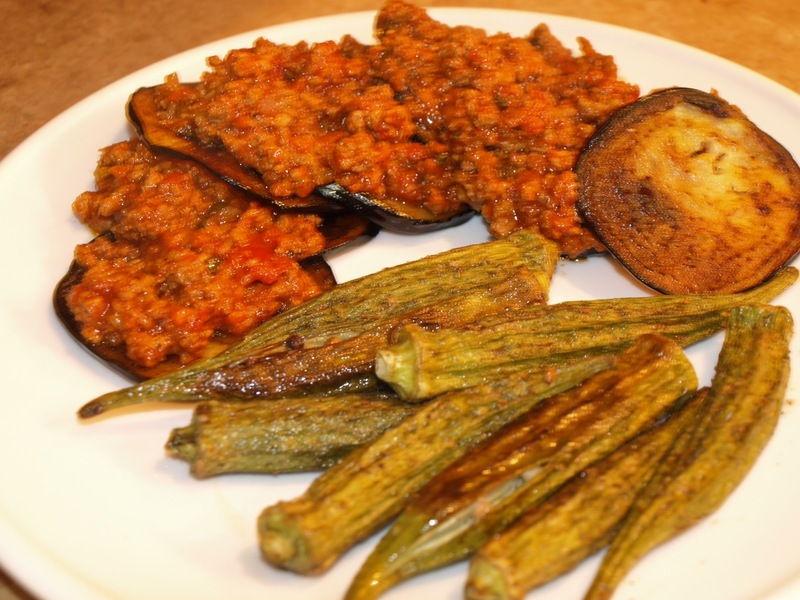 I layered eggplant and meat on the plate, and added some finished okra on the side. This was a definite hit with Kourt! Another night I decided to try some fish at the house. We don’t get much fresh fish here in Central Louisiana, so I decided to try some cod from Sam’s Club that is frozen at sea. It was actually quite good, and I’ll be using it again. Then I attempted to make fish tacos, without the tacos! 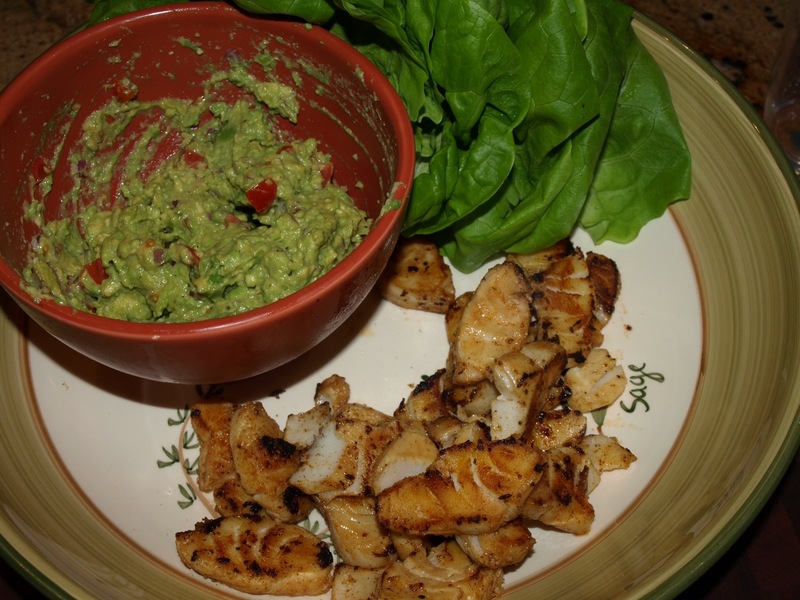 This recipe is also from Paleo Comfort Foods, and I suggest ya’ll check it out! I was quite tasty indeed. 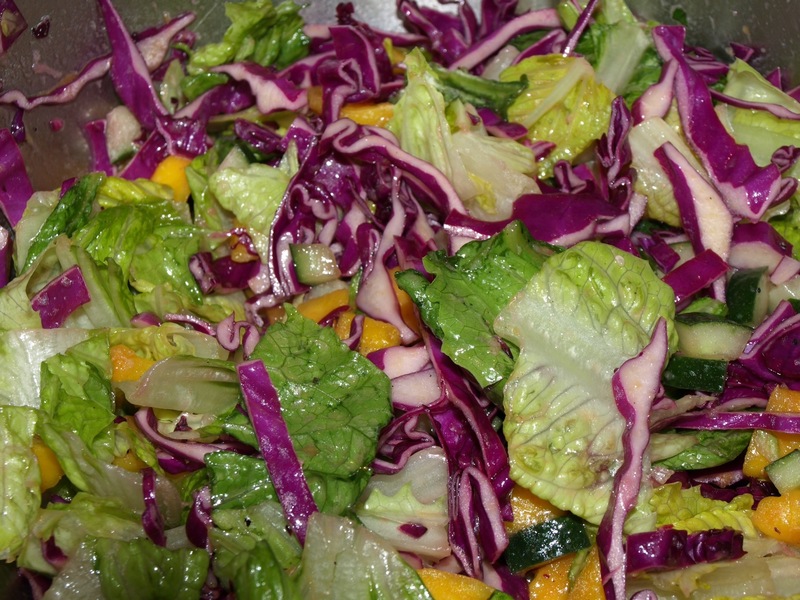 Served a little slaw on the side with red cabbage and mango dressed with a semi-sweet vinegarette! Hope you guys enjoy, and I hope to get back to cooking a little more soon! 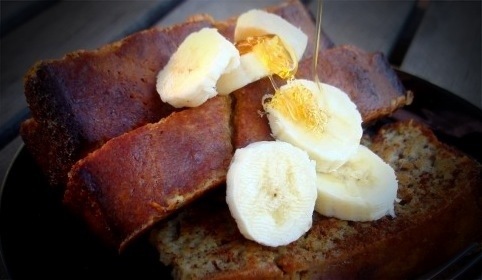 This is the most amazing Paleo breakfast I have found so far! I found this recipe at Paleomg.com. No adjustments are necessary for her recipe–it is perfect. The only thing I did differently was use Agave nectar instead of maple syrup. Well, I had an excellent day off, that included an extended nap! 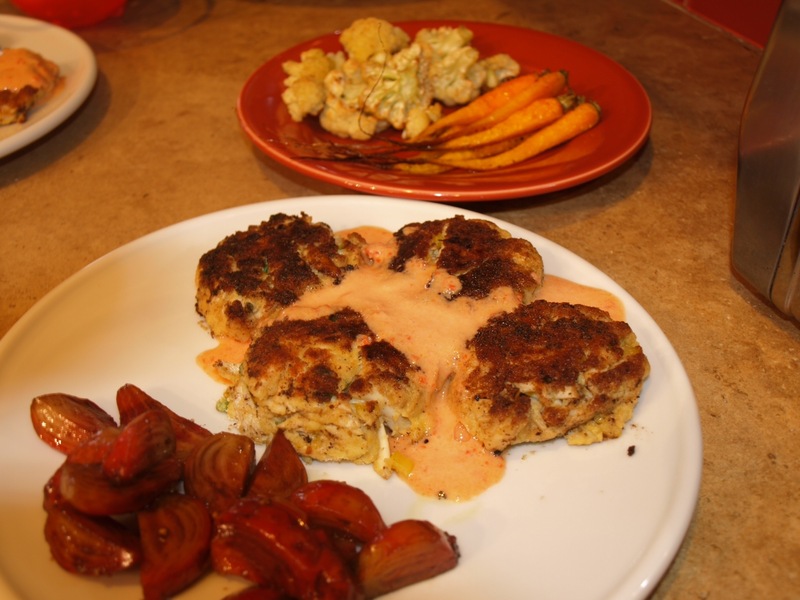 I’ve been thinking of how to improve my crab cake recipe, and I think I did it today! So, here we go! I started with some wonderful beets I got from Inglewood Farms (all the produce tonight is from Inglewood). I washed and trimmed them, put them in an oven proof dish, add a splash of water, cover tightly with foil, and put in a 400 F oven for 45 minutes or so. 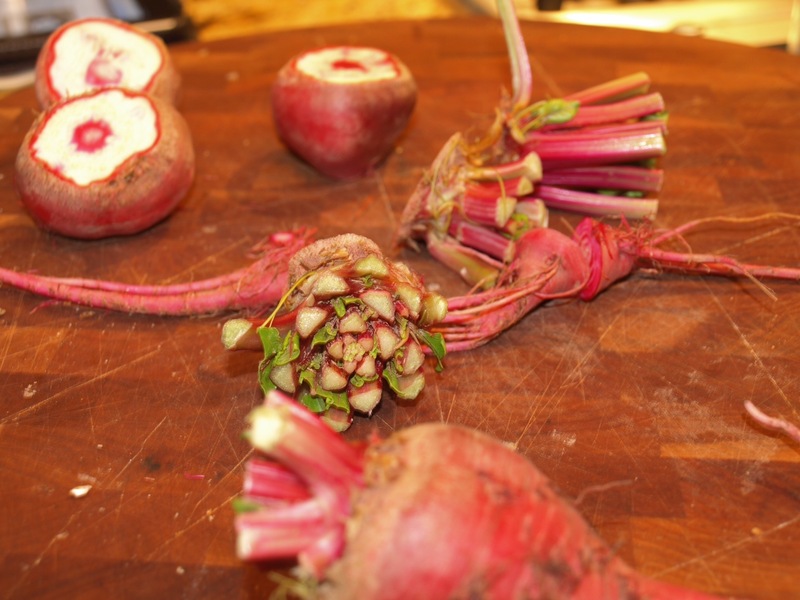 The actual cook time will vary depending on the size of the beets. Once done, let them cool, and use the back of a pairing knife to peel off the skins. Dice them up and place in a bowl with salt, pepper, and your vinegar of choice. Now I like beets, and most cookbooks I have say to let the beets marinate in vinegar a while before adding any oil. 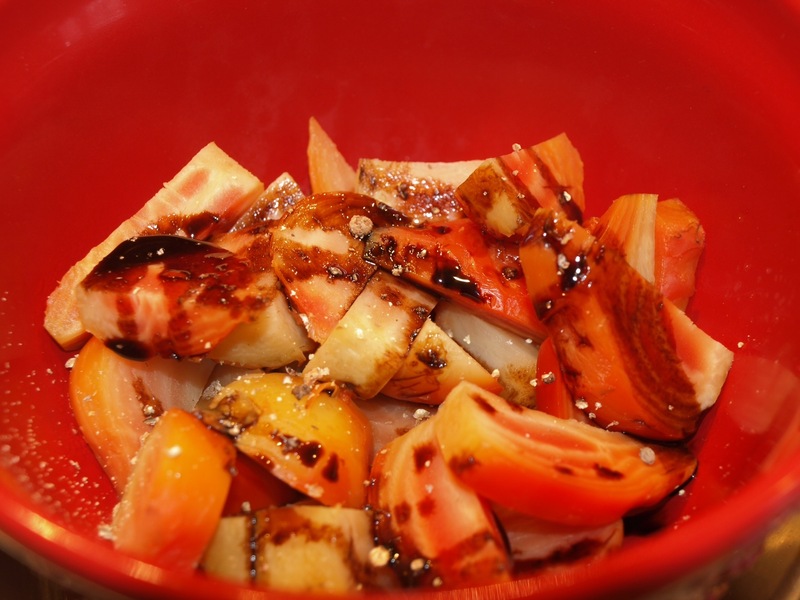 So, I added balsamic vinegar and around 30 minutes later, added a bit of extra virgin olive oil. Beets done! Next I’ll address the side vegetables. 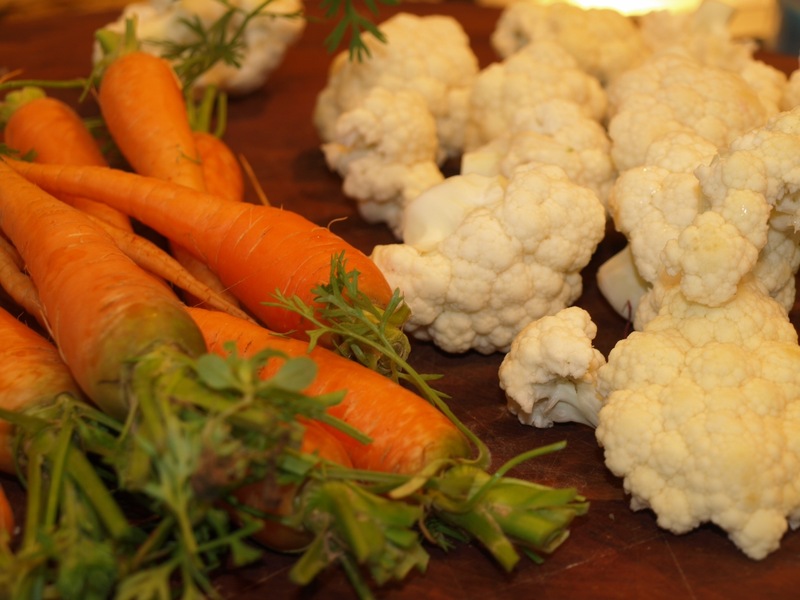 Tonight we had carrots and cauliflower. I trimmed and peeled the veggies, and placed them on a sheet pan. On the carrot side I added some garlic infused macadamia nut oil with salt and pepper. For the cauliflower i added olive oil and garlic powder. The pan went into the same 400 F oven for around 30-40 minutes and that was it! 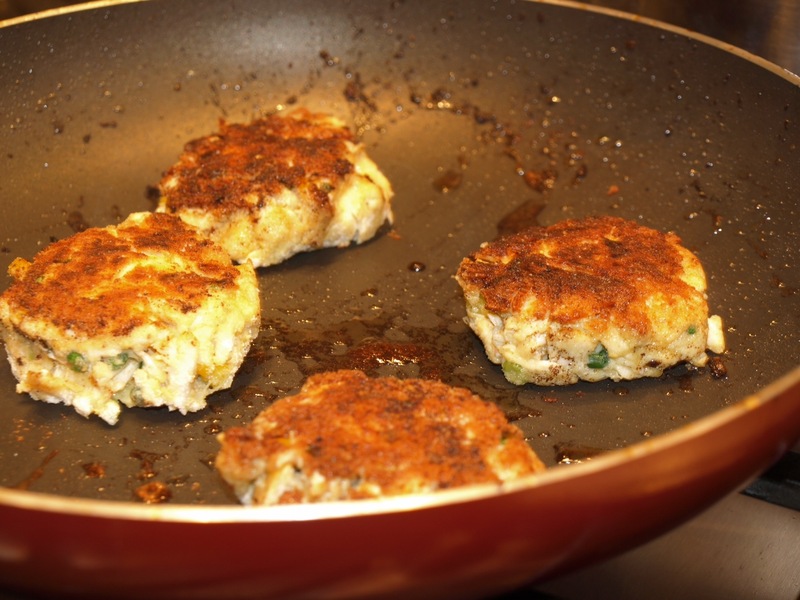 Lastly for the crab cakes. 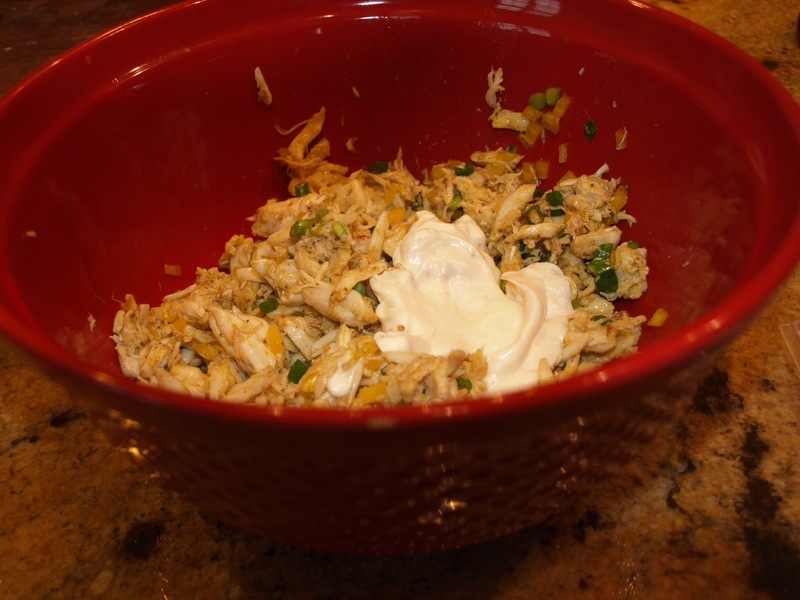 In a bowl I put half a yellow bell pepper diced finely, three scallions diced finely, one egg well beaten, two tablespoons of paleo mayo, a tablespoon of Old Bay Seasoning, and a pound of fresh crab meat. 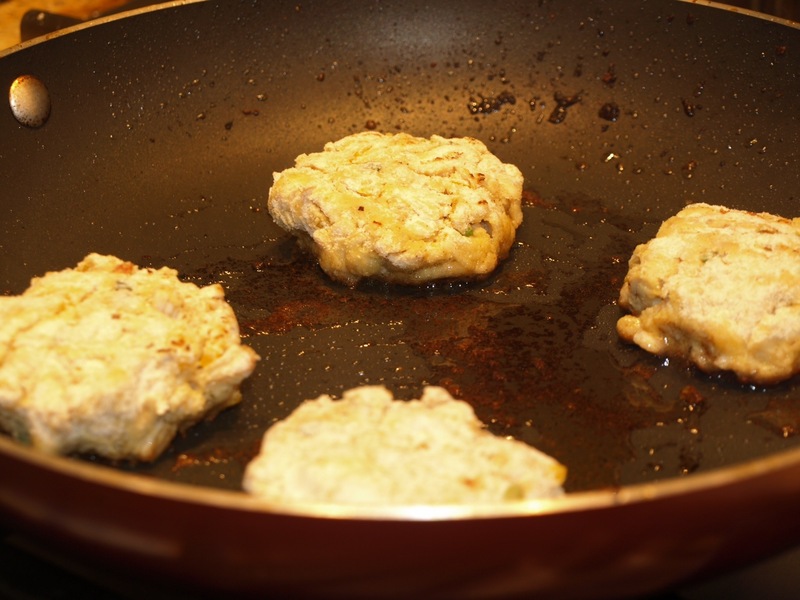 Gently mix the ingredients and form into 8 small patties. Put them in the fridge to firm up so they stay together while you fry them up. 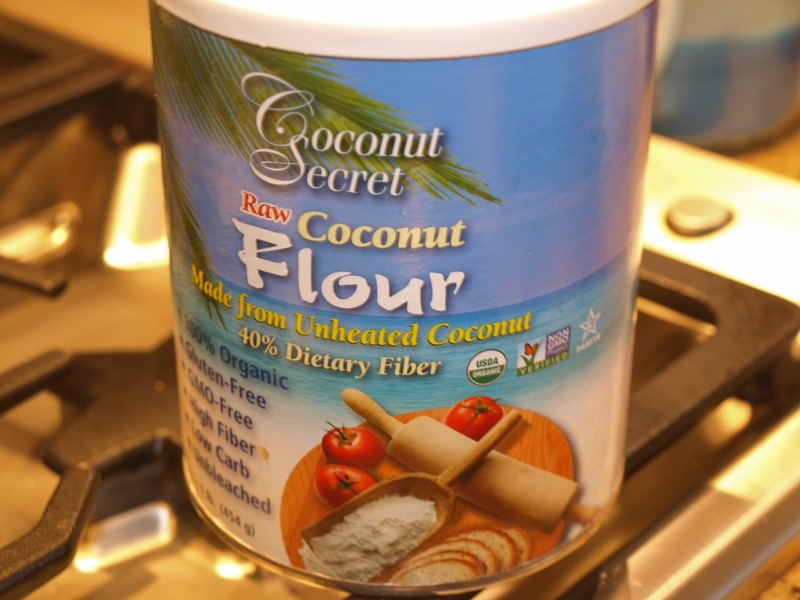 In a shallow plate sprinkle some coconut flour. Melt a little coconut oil in a skillet over medium high heat. Coat the cakes in flour and fry in the coconut oil around 3-4 minutes a side until the are a nice golden brown on both sides.